At every given point in time there are two points on the equator of the Earth that have the same temperature. How do we know this? Well, here’s a proof. Let’s look at the equatorial plane which slices through the Earth at the equator. The equator is a circle which lies in that plane, and we can choose a coordinate system on the plane so that the point lies at the centre of the equator. 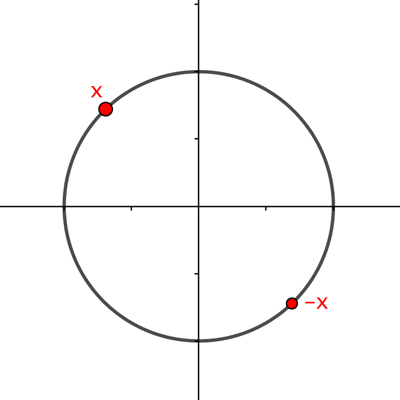 For each point on the equatorial circle there is a point which lies diametrically opposite . Now each point on the equator comes with a temperature . 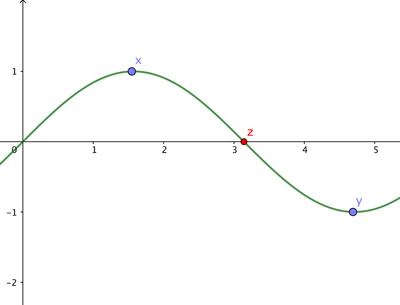 We can assume that the function , which allocates a temperature to each point, is continuous. That’s because temperature doesn’t suddenly jump up or down as you move around on the Earth. so the temperature at is the same as the temperature at . There is a result, called the intermediate value theorem, which says that if a continuous function is greater than at some point of its domain and less than at another, then it must equal at some point in between the two. Illustration of the intermediate value theorem. If t(x)>0 and t(y)<0 and t is continuous, then there is a point z between x and y such that t(z)=0. The more general version of the Borsuk-Ulam theorem says that for any continuous function from the -sphere to the set of -tuples of real numbers there is a point such that . I'm sure I am missing something, but for this continuous function there is 'a' maximum value and 'a' minimum value, (1st moment =o) this is only at a single (x) value? The theorem states that there are two points on the equator with the same temperature. It does NOT state that for any given temperature found on the equator there is another at that same temperature.